The Letter to the Hebrews speaks eloquently of a new High Priest, who is Christ. With the old covenant blood was used to cleanse the sins of the followers of the law. An annual tradition, a Day of Atonement would have the high priest entering the sanctuary and offering an animal blood sacrifice for the cleansing of sins. For the next year their sins were acquitted, but the sacrifice needed to be repeated. Christ as High Priest did not offer animal blood to cleanse the sins of the people, but his own blood. Christ does not enter an earthly sanctuary but enters the actual heavenly sanctuary. Christ sacrifice does not need to be repeated, it is a cleansing sacrifice done once and good for eternity. In this new covenant we have a High Priest who cleanses our sins and is available to us directly. We die once and are judged. 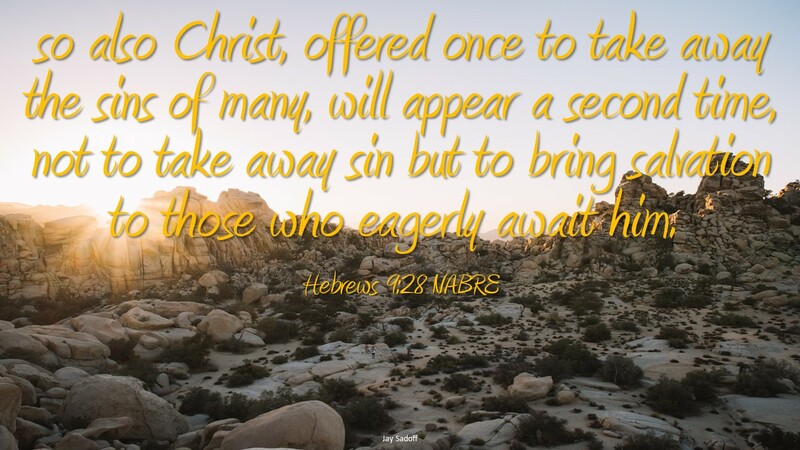 Christ appears a second time to those who await his salvation. With the old covenant the priest was the intermediary between God and the people, with the new covenant our new High Priest makes God available to us directly. It is not obvious that blood would cleanse us and make us pure, but a sacrifice is what is offered to God to seek salvation. The old covenant sacrifice models a sacrifice that would become the new covenant when Christ sacrifices Himself. The cleansing blood of Christ cleansing all our sin. It does not cleanse only an original sin, but all our sin into eternity. Christ makes the heavenly sanctuary available to all of us, priest or not, anytime we desire. Do you struggle understanding why Christ had to die for you? Can you believe this mystery without understanding it?